When you prepare for your hiking trip, one of the most important things to think about is a hiking hat. A good quality hiking hat can protect you from the harsh sun rays and the light rain. On the other hand, a winter hiking hat is capable of keeping your warm and retaining heat so that you will not feel ill after a trip. It is important as you tend to spend a lot of time outside when you go on a hiking trip. In order to find the best hiking hats for guys, there are a lot of things that you need to consider, including the material and the construction of the hat. Other features of the hiking hats to think about include the chin cord or the high quality sweatband. You need think about the season when you go hunting as well. 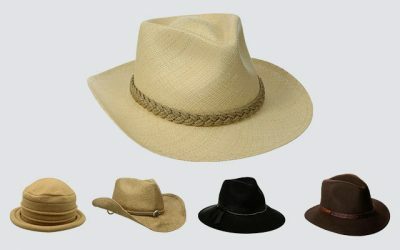 (Further tips on how to choose a hiking hat are included in this article). 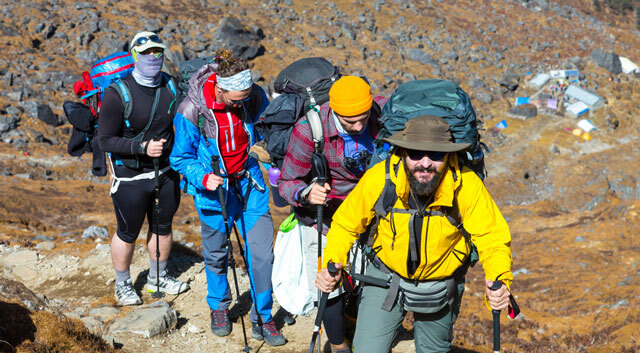 Our guide below features the best hiking hats with the premium quality that will ensure that your hiking trip is highly comfortable and enjoyable. Its Main Features: You cannot complete a list of the best hiking hats for guys without mentioning a product from Dorfman Pacific, such as this one. 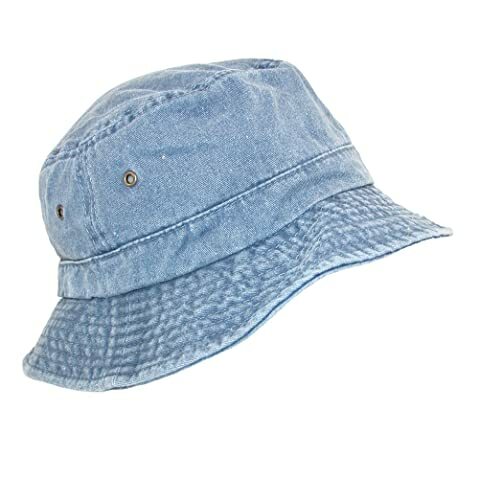 If you are looking for a summer travel or hiking bucket hat, check out this option. It is made of 100 % of cotton with brass tone ventilation eyelets. There are 7 options of colors for you to choose from, from navy, sand, to the classic black or white. The width of the brim is 2 inches. The best hiking hat for the summer trips needs to be lightweight and breathable. Thanks to the premium cotton which is used to make this hat, it meets those requirements. 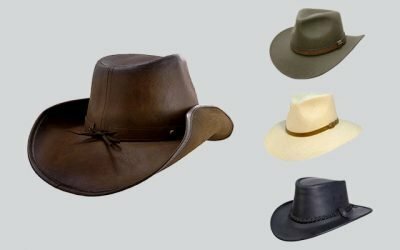 In addition, there are several ventilation eyelets around the crown of the hat to ensure that the air moves freely and your head is kept cool and dry at all time. The hat is soft and smooth on the touch. In addition, you can easily fold the hat and pack it inside a small bag to bring a long with you when you go travelling. While it is soft, it is also tough and durable. You can wash the hat by hand or with the washing machine. The dyed cotton twill finish of this hat is suitable for a Vintage look as well, if you decide to wear the hat not only when you go hiking but also in your daily life. Its Main Features: This hiking sun hat is made of 100 % of cotton with a mesh panel that spans entirely on the top part of your hat. This hat features an adjustable drawstring. The width of the brim is 2.5 inches. There are 4 options of colors for you to choose from including dark khaki, light khaki, grey and army green. 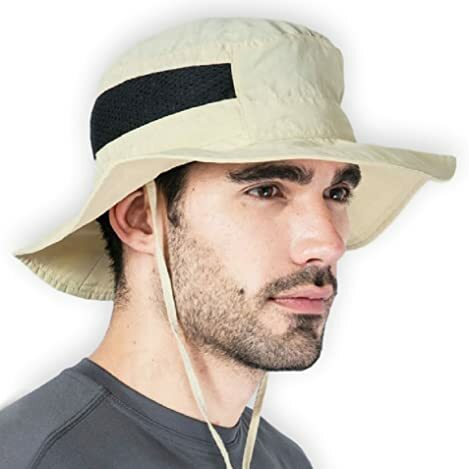 The brim of this hiking hat for men is decent to cover a wide area of your face. In addition, the fabric of this hat is rated 50 + for its ultraviolet protection factor so that it can effectively block the harmful elements of the harsh sun rays away from your face. This hat is also windproof. It comes with an adjustable chin strap to keep the hat stay secured on your head in case of a high wind. The material of this hat is of premium quality as it is lightweight and breathable. In addition, with the mesh panel, this hat promotes the air circulation and keeps your head cool and dry all of the time. 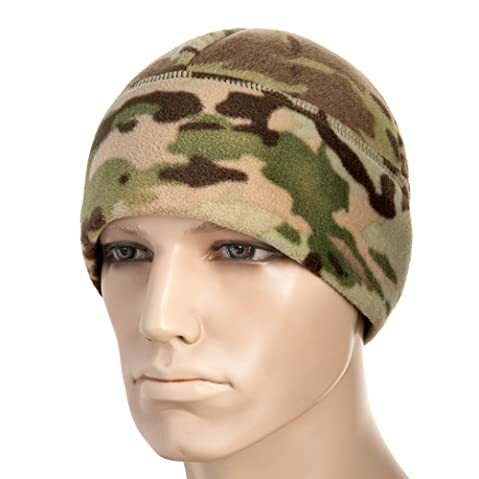 The internal sweatband of this hat is also very soft and smooth, which is capable of wicking sweat and moisture and prevent them from getting into your eyes. Furthermore, this hat is crushable and packable into a small bag for easy storage and carrying around. 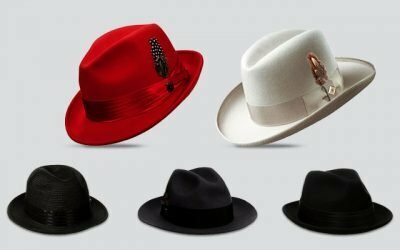 When you take the hat out, it will get back to its original form easily. Another great thing about this hat is that the manufacturer offers a lifetime warranty on it- meaning that your initial investment is secured for a long time to go. 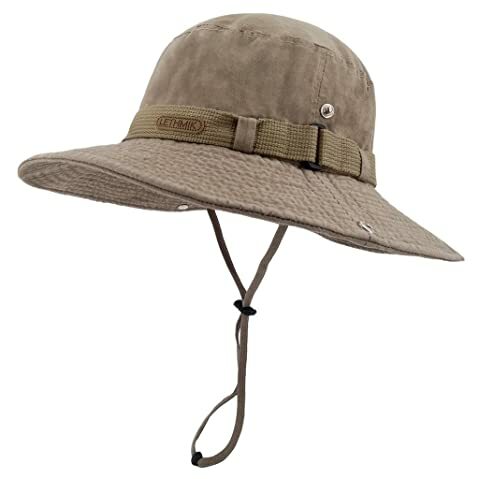 Its Main Features: This hiking hat for men is made of 100 % of supplex nylon Tilley Nylamtium. There are 9 options of colors for you to choose from including the solid colors such as grey and black as well as camo patterns such as multi cam. It features the a fit low and loose design. There is a chin cord attached to the hat. This hat is among the best hiking trucker hats for guys that you can find on the market. The first thing to mention about this hat is that it is well ventilated. It has a breathable fabric and along with the mesh area around the crown of the hat, the hat is cool and comfortable to well. The eyelets add extra air circulation as well. The heat band is effective in wicking moisture away from your forehead as well. Another thing to mention is that the fabric of this hat is rated 50 + UPF so that it can effectively block the harmful UV rays away from your sensitive skin. It is worth mentioning that since this hat is made from the premium nylon material, it is water repellant so that you can easily wear the hat under the rain or have to wait for just a little bit for the hat to dry. Another thing that I love about this hat is that it comes with a secret pocket in the crown with the Velcro closure system. You can store various items such as cash, credit card or fishing license inside this pocket and have them ready at all time. Last but not least, this hiking hat features a dark interbrim to help reduce glare from water, sand, and pavement, allowing you to have the best sight when you take part in any outdoor activity such as hiking. 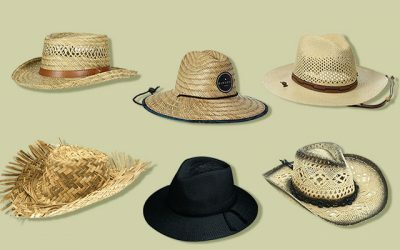 Its Main Features: The above hats are the best hiking hats for the summer. What about the best hats to wear on a hiking trip in the winter? Check out this option from SIGGI. This hat is made of 100 % of cotton. You can choose among 6 different choices of colors including blue, black, and navy. It is available in 1 size that can fit head’s circumferences from 22.4 inches to 24 inches. First of all, the cotton material of this hat is of premium quality. Hence, it is soft and smooth yet tough and durable. It is worth mentioning that the fabric is insulated so that your head is kept warm in the chill winter. Not to mention that this hat features the soft cotton and polyester pillow lining so that you will feel comfortable wearing this hat for a long time. This hat comes with the earflaps to help cover your ears. Also, the earflaps, the neck and the forehead parts are lined with the top notch fake fur so that heat is retained to keep you warm even in the coldest day. Not to mention that the fur is also soft and skin friendly so that you will not feel irritated at all. You can move the earflaps under the chin or move them towards upside in case it is warmer using the buttons to button up or down the earflaps. So there are several styles that you can have with this hat. 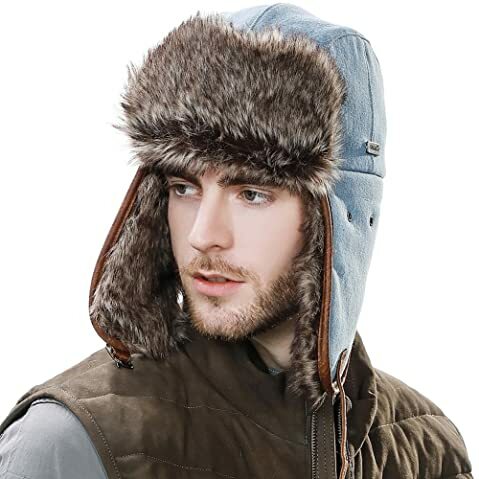 You can wear this hat in your hiking trip, hunting trip as well as in other occasions in the winter. It goes well with other winter clothes in your wardrobe. The materials are quite sensitive. 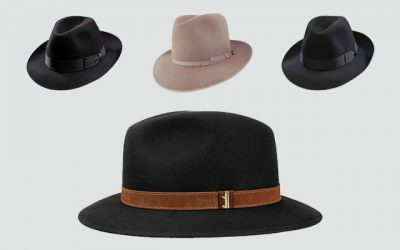 Hence, you should wash the hat only by hand with cold water to ensure the quality of the hat is maintained. Its Main Features: Here comes another winter hat for your hiking trip. 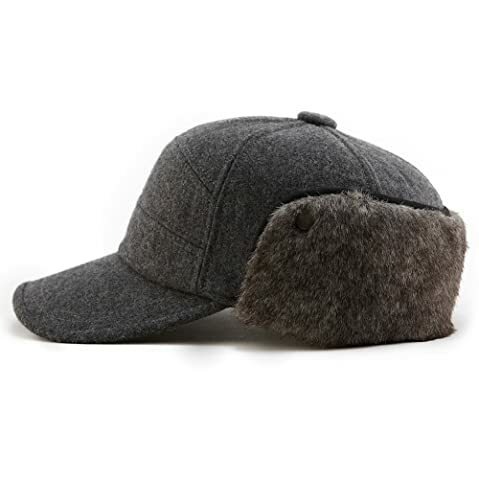 this hat is made of 50 % of wool and 50 % of polyester for the body of the hat. The lining is made of 100 % of polyester while the fur is made of 80 % of acrylic and 20 % of polyester. This hiking hat is available in 2 colors, including black and grey. There are several sizes, from small to large for you to choose from. The brim is reinforced so that it will not become flimsy in case of a high wind. The visor of this hat is also long enough to prevent the sun and the glare of the snow from getting into your eyes. Hence, it is a great hat to wear when you go outside in the board day light for camping, hiking, or cycling and snowboarding. With this hat, you have the style of 2 types of hats in 1- the baseball cap and the ear warmers. The earflaps and the neck warmers provide extra protection for your neck and your ears, especially when it is extremely cold outside. The earflaps come with the snap button. So you can flip the earflaps up when it is not so cold and flips the flaps down otherwise. These buttons are not so stiff but they are secured enough to do their job well. Like other winter hats which are made of wool with other materials, you should wash the hat with cold water and by hand only. Its Main Features: Here comes another hiking hat that you could wear for your hiking trip in the winter. This hat is made of 100 % of soft-spun acrylic along with the artificial wool inner liner. It is available in 1 size. There are various choices of colors for you to think about such as classic black, deep grey, red wine, and navy blue. It features the criss-cross basket weave knit design. Like other high quality winter hat that you can find on the market, this hiking hat is made of the premium quality, which is soft and stretchy. Hence, the hat can bring you both warmth and comfort. 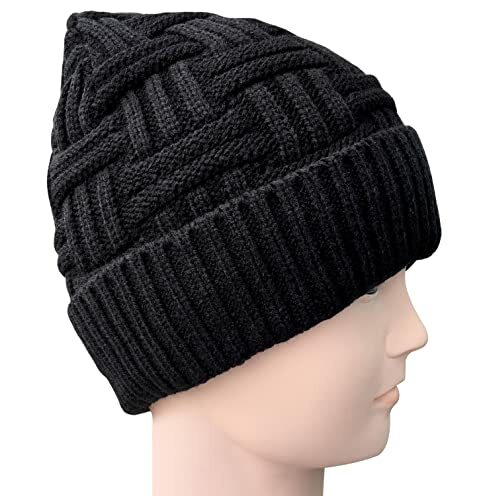 Also, it has the hand-knitted feel so that your forehead will not feel irritated at all when wearing the hat for a long time. Not to mention that there is a liner which is made from a artificial wool. This part provides extra warm and prevents your forehead from rubbing against the hat, causing irritation. You can wear this hat not only when you go hiking. It would pair well with your winter clothes such as your jacket or sweater. While this hat is available in 1 size, the material is stretchy enough to fit on your head perfectly. It also brings you a classy and polished look with this hiking hat. It is not exactly the hat that you would wear in the coldest summer day but it is really helpful for a cool autumn or early winter day. 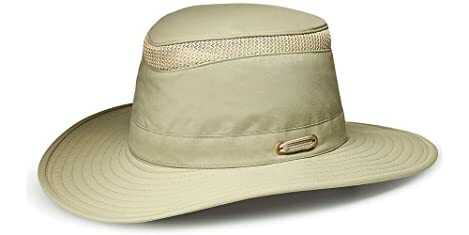 Its Main Features: This hiking sun hat is available in 7 options of colors including flaxen, khaki, and grey. You can choose between 2 options of fabrics, including washed cotton and waterproof polyester. The most significant feature of this hat is the innovative materials which are used to make this hat. 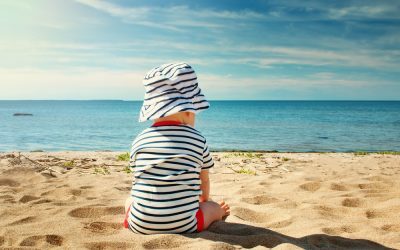 The fabric is rated UPF 50 + which is highly effective in protecting your sensitive skin, especially when you are exposed to the direct sunlight for a long time. In addition, the sweatband is made with the premium cotton material is effective in wicking moisture away and keeping your head cool all of the time. The materials of this hat also make it soft, lightweight, and comfortable to wear. 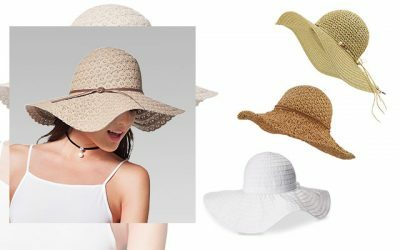 Besides the breathable material, this hat also has the mesh area to enhance the air circulation around your head, even in the hottest summer days. Thanks to the advanced technology in the material, it is also water resistant with a quick drying performance. Hence, it is one of the hiking hats for men that you can think about when you prepare for a hiking trip in the rainy season. The hat is foldable and crushable. The brim can be folded up or down depending on the style that you want with this hat. In addition, with an adjustable chin drawstring, you can wear this hat when it is windy outside. Last but not least, the hat is made with an excellent craftsmanship so that all seams are lock-stitched and they won’t unravel. You would not be able to find any loose threads. Its Main Features: This winter hiking hat is made of 100 % of polyester. There are 10 options of colors for you to choose from including army olive, brown, black, or white. This hiking hat for guys is available in 3 sizes, including small, medium and large. Undoubtedly, this hiking hat has all of the features that you would need in a hiking trip during the winter. Thanks to the premium material, this hat is warm and thick. While the hat is made of polyester, it is insulated with the Slimtex heater, which in turn, can provide you an ultimate thermal retention. As a result, you have a hat which is thin and lightweight but at the same time, warm and cozy. Another great thing about this hat is that the material is safe on sensitive skin. It is hypoallergenic so that it will not cause any irritation for your skin, even when you have to wear this hat for a long time. Last but not least, this hat is well made with an excellent craftsmanship for a solid and sturdy construction. All seams and neat and flat and there is no loose thread. This beanie hat comes with a low profile design so that you can wear it under the hood. It goes well with your winter clothes but you can also try some options such as olive green or camo pattern with your military clothes. It is suitable for the cool days, but not the coldest. For the best hiking hat to wear when the temperature gets lower and lower, check out the other option below. Its Main Features: This hat is made of 100 % of fleece material. 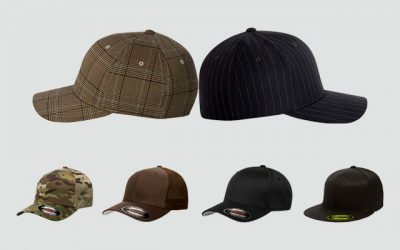 You can choose among 6 options of colors such as camo pattern, coyote, grey, and black. There are 3 options of sizes available as well including small, medium, and large. Since this hat is made for you to wear in the coldest winter day, it is warm and cozy. 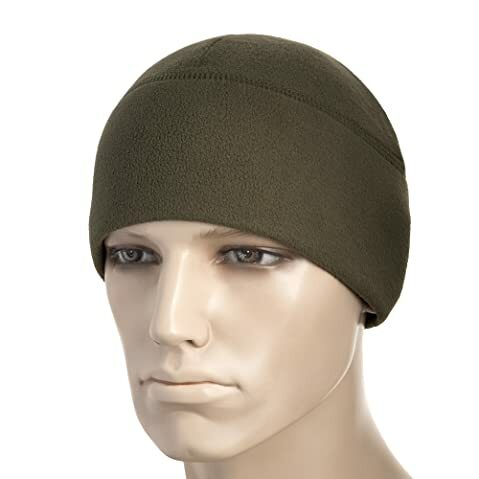 It is insulated to help retain the heat and keep your head warm effectively as well. 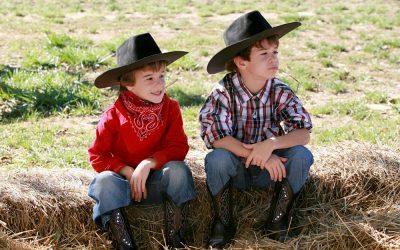 In addition, it is soft and elastic to ensure your utmost comfort when wearing the hat. While the hat can keep you warm, it is also breathable so that you don’t feel hot and irritated when you have to walk for a long time. And like other winter hats which are made from the same company- the M-Tac Tactical Hat, this hiking hat is mad with the premium and skin friendly fleece material so that it is safe to use on the sensitive skin, causing no irritation or itchiness at all. There are 2 options of fleece to choose from. You can have one which is windproof in the forehead in case it is windy and one with the mesh on the top of the hat in case the winter is not that cold in the area where you go hiking. Both of the two options are water resistant and have a quick drying performance. Finally, the hat is tough with a solid construction. You can wash the hat both by hand and with the washing machine. You can also fold the hat and pack it along with you when you go travelling. 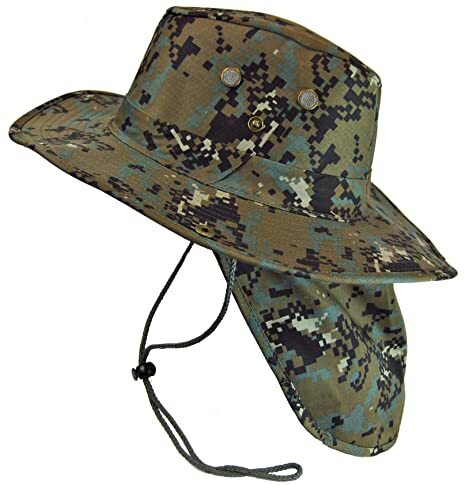 Its Main Features: Are you looking for a hiking hat for men in the camouflage pattern? Check out this high quality hiking hat. There are several camo patterns for you to choose from including the desert pattern, the plain solid khaki, the dark olive green, and the digital woodland. The materials which are used to create this hat include 60 % of cotton and 40 % of polyester. This hat features the boonie hat style with a 3 inch wide brim. It comes with a neck flap as well as 4 grommet eyelets, a mesh screen as well as a chin strap and a cord lock. Like other high quality hiking hats for guys that you can find on the market, the materials of this hat is of the premium quality. It is breathable and lightweight. Also, with the mesh screen and the metal eyelets, you will have the optimum air ventilation to keep your head cool and dry all of the time. The thick fabric, the wide brim and the neck flap are capable of blocking the harmful elements of the direct sunlight and protecting your sensitive skin. It is well made for a solid and sturdy construction. The brim will not flip up and down or become flimsy when there is a big wind coming against you. Not to mention that the chin strap can keep the hat stay secured on your head regardless of how windy it is outside. 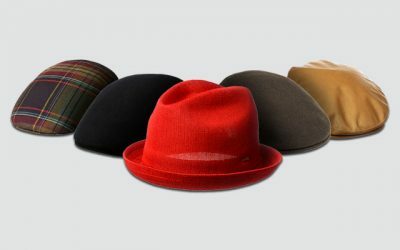 Lastly, this hat is available in sizes from Small to Extra-large, offering you a lot of sizes to choose from so that you can find the hat which fits your head perfectly and comfortably. The problem you might have with this hat is that the fabric is stiff; hence, you would not fold the hat as easily as folding other hiking hats. It is a little bit inconvenient when you pack the hat with you when you go travelling. 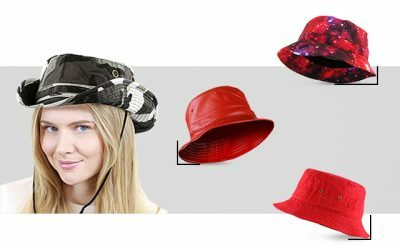 It is worth spending your time and effort in searching for the best hiking hats on the market as the suitable hat will ensure your sensitive skin are protected and you will feel comfortable throughout your trip. 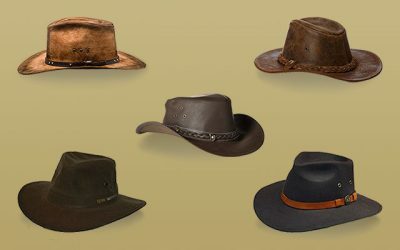 I hope that with all of the information above, you can quickly find a hat that meets all of your needs and requirements for your next hiking trip.